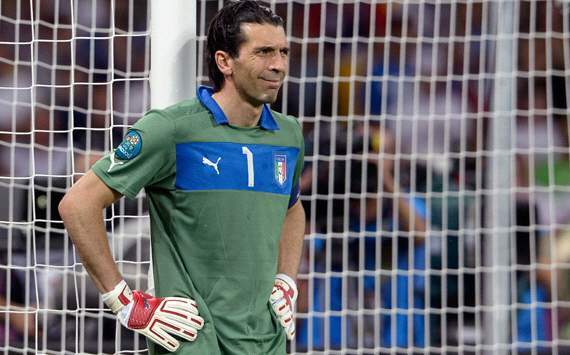 Juventus North America Blog :: GIGI BUFFON - JUVENTUS’ NUMBER 10? The whispers are becoming louder in the Bianconeri camp. Rumour suggest that the "Grande" Buffon could be next to take hold of Alessandro Del Piero’s coveted jersey. The number 10 jersey represents a historic value at the Turin giants, as some of their greatest players have worn and honoured the number. Now reports have emerged that Buffon is planning to take hold of the shirt for himself, in order to put an end to the friction between the competing players of the team to get the jersey. Sebastian Giovinco is reportedly interested in gracing the shirt with his shoulders, and has several contenders in the camp already including some new signings. Moreover, Juventus are also interested in signing Fiorentina starlet Stevan Jovetic, who could also have a strong interest in wearing the jersey that is prized in Turin. Buffon currently wears his favourite number one, and will have to leave his shirt vacant in order to get hold of the number 10. The Gazzetta dello Sport report that the initiative by the goalkeeper is also an attempt by the veteran to save any new player, which wears the jersey, from the crumbling expectations of living up to the legendary shirt at the Old Lady. President Andrea Agnelli has also stated in a recent statement that the he will not be having any say in deciding upon the successor for the coveted shirt, and insisted that he would prefer leaving the matter for the players to decide among themselves. If Buffon chooses to take on the jersey, this will not be his first time wearing a number other than his favourite digit 1, as he also wore the No. 77 and 88 during his stint with Parma. NO.10 football shirt is a desirable number.Now Juventus NO.10 shirt is Tevez.